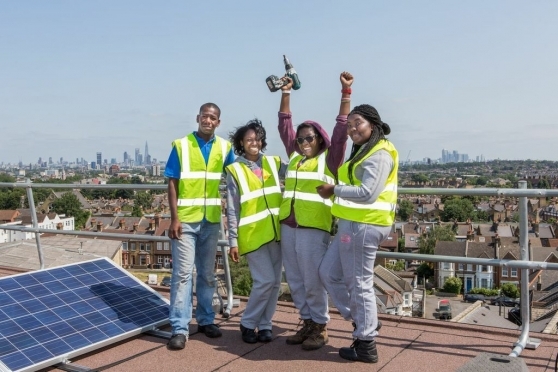 Building on the success of our award winning completed Brixton Energy Solar projects, Repowering London has recently received a grant of £125,000 from community business fund ‘Power to Change’ to expand community energy in Brixton. Through these projects we aim to create social and environmental benefits, as well as an additional source of revenue for the community. As well as conventional solar panels, we are looking into different forms of sustainable technology for our future projects with Power to Change, such as: efficient combined heat and power (CHP), energy storage technology, LED street lighting, and anaerobic digestion processors, which effectively convert wasted food into valuable heat, cooking gas, and plant fertilizer. With these projects, Repowering will support and host numerous activities to engage and inspire local people to get involved, including: community meetings, mentoring sessions, training, energy advice and solar panel-making workshops, home energy audits, and paid internship placements for young people living on the estate project sites. These 40-hour internships will cover the financial, technical, legal, and PR elements involved in such a community-owned renewable project. It is our ambition to see up to 1 MW of community-owned renewable energy generating capacity installed in Brixton. So far, we have identified seven potential project sites with a total of 0.5MW of solar generating capacity, and by June 2017 we are confident that we will find a further 0.5MW worth of solar energy on more locations around Brixton. If you would like to get involved in this exciting new program, please do get in touch by emailing info@repowering.org.uk. Power to Change is a community business fund endowed with £150 million from the Big Lottery Fund, to be used over ten years. It supports sustainable community businesses which aim to address local challenges and bring vital assets and services under the control of its community’s members. In doing so, these community businesses become less dependent on grants, and are able to have greater impact on the communities and people they serve.